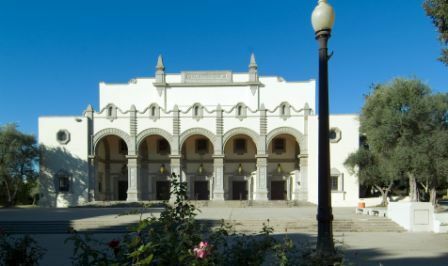 Gardner Spring Auditorium at Chaffey High School, one of the many historic buildings on the Chaffey High School campus. Ontario’s history remains one of its greatest assets. Its historic districts and resources, physical layout and the legacy of its people, businesses, social and community organizations, and industries contribute to the City’s identity. Beyond having been declared the “Model Colony,” by an act of Congress, Ontario’s history includes citrus farming, viniculture in Guasti, and dairy farming. With some of the most authentic historically distinct residential neighborhoods in Southern California, Ontario is among a handful of communities whose creative and proactive approach to historic preservation serves as a model for others. The Museum of History and Art, Ontario has long recognized that the story of its businesses, industries and people are as important as the history of its neighborhoods, buildings, streets and landscapes. Historic buildings, streets, landscapes and neighborhoods, as well as the story of Ontario’s people, businesses, and social and community organizations, that have been preserved and serve as a focal point for civic pride and identity. Cultural Resource Management. We update and maintain an inventory of historic sites and buildings, professional collections, artifacts, manuscripts, photographs, documents, maps and other archives. Collaboration with Property Owners and Developers. We educate and collaborate with property owners and developers to implement strategies and best practices that preserve the character of our historic buildings, streetscapes and unique neighborhoods. Collaboration with Outside Agencies. We pursue opportunities to team with other agencies, local organizations and non-profits in order to preserve and promote Ontario’s heritage. Incentives. We use the Mills Act and other federal, state, regional and local programs to assist property owners with the preservation of select properties and structures. Adaptive Reuse. We actively promote and support the adaptive reuse of historic sites and buildings to preserve and maintain their viability. Promotion of Public Involvement in Preservation. We engage in programs to publicize and promote the City’s and the public’s involvement in preservation efforts. Public Outreach. We provide opportunities for our residents to research and learn about the history of Ontario through the Planning Department, Museum of History and Art, Ontario and the Robert E. Ellingwood Model Colony History Room.